The growth of the urban population in Indonesia is commonly fast due to permanently inclinig urbanization flows. This chapter considers the most important factors of Indonesian urbanization and its positive and negative effects in current conditions to discover directions for modernization of the governmental role in regulation and control of urbanization processes. 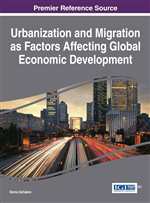 Special issues of this chapter are concentrated around the problem of urbanization's role in development of Indonesia (national and regional level), national labor and internal migration policy, and niveling disbalance between urban and rural areas. Finally, this chapter includes special conclusions and reccommendations for modernization of national and regonal programs oriented to optimise internal conditions of urbanization development in Indonesia that are based on the best achievements of international experience and use local Indonesian features of urbanization. The world faces a demographic problem in developing countries which are increasingly vulnerable. It is estimated that the world population has reached 7 billion. It will continue to increase until it reaches 9 billion. It is estimated that 70% of the world population will live in cities. (http://thepresidentpostindonesia.com).